If you’re like most of us, before you can start work innovating customer’s experiences, you need the proper buy-in to get initiatives off the ground. Since customer experience is part of business strategy, many innovation projects impact the way your company conducts business. This means you’ll not only need managerial buy-in; you’ll need the executive votes to proceed. The good news is that High-Level Journey Maps can be the tool you need to help communicate and get those approvals! Creating these “bird’s-eye view” maps allow you to break through the clutter and confusion by conceptualizing each interaction and its relation to the entire journey. All in one snapshot. In the EBook “High-Level Journey Maps & Five Steps to YES”, you’ll learn how these simplified maps can help you communicate your Customer Experience intentions in a way that will get you the YES votes you need, and how to involve others in your company in order to influence the outcome in a positive way. 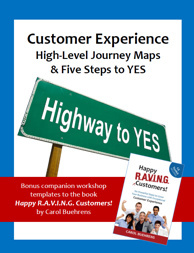 Download your free E-Book “High-Level Journey Maps & Five Steps to YES” to help jump-start your Customer Experience Action Plans! In my book, Happy R.A.V.I.N.G. Customers!, “Chapter 3. R = Reality Check” focuses on how you can use journey mapping to identify all of your customer’s touchpoints. In “Chapter 5. V = Vote to Change”, you’re provided several strategies and ideas for getting the votes you need to make a change. In “Chapter 6. I = Innovate in Unexpected Ways”, you’ll learn how to use journey mapping to go beyond your competition and create memorable experiences of differentiation. Why is it important for User Experience (UX) professionals to understand the “Customer Experience Journey”? Because it helps their UX vision! UX involves a person’s behaviors, attitudes, and emotions about using a particular service or product. In CX terms, we call that “experiencing a touchpoint”. It only stands to reason that the UX professional can and will improve their products when they understand where their project fits and what their “user” expects. UX, while being a different discipline than CX (see examples in chart below), greatly benefits from knowing this critical view: the customer and the customer lifecycle. CX teams should form a close partnership with UX teams, in order to provide this customer insight and to help innovate touchpoints. After all, the experience provided by your UX team is part of the continuum that creates the overall customer experience! Most likely, during your customers’ lifecycle (as shown below), your customer will continually interact with the very systems and processes that were designed with the help of your UX team — Web sites, POS systems, mobile apps, documentation, and other interfaces. In my book, Happy R.A.V.I.N.G. Customers!, “Chapter 3. R = Reality Check” focuses on how you can identify the journeys your customers take with your company, in order to deliver experiences that are important to them. With so much hoopla made over the digital customer these days, we might forget that Customer Experience is not so one-sided. The term is defined as “the cumulative impact of the total interactions customers have with your company, people, services and products.” This means we have Omni-customers. It’s hard to believe, but customer experience really does cover all interactions. Not just online interfaces – the whole enchilada, stock and barrel, everything. From every social media offering, face-to-face, phone conversations, emails, snail mail, white papers, contracts, collateral, marketing campaigns, phone tree call-flows and recorded messages, how employees answer phones, the out of the box experience, product usage, product maintenance, product return, online and offline services, the line goes on. This is merely a fraction of the total interactions. And, of course, your company websites, blogs, job listings, online product guides, shopping cart, etc. etc. etc. Some things you control, others may be out of your control. 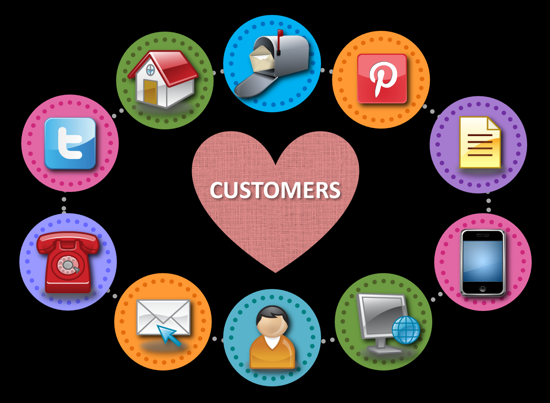 But to your beloved customers, these interactions – all of them – represent your brand. They don’t distinguish between an online or offline brand, and neither should you. Put the hat of your Omni-customer on and walk in their shoes. Establish a little journey to go on. Maybe you start at the website and try to find something. Test the phone number given. Use your phone tree to go through the options. Are they helpful? Do they lead you to the correct destination? Test a few extensions using an outside line. Do employees answer with cheerful voices, providing their name and department? Are they ready to help? Collect all of the printed and digital artifacts, such as mailers, emails, and other pieces of customer communications. Print them out and tape them up side by side to visually compare. Continue doing this for everything so that you get the full breathe of the journey. Does it provide the brand values your company stands for? Don’t take it for granted that all interactions align to your brand and provide the great experience you hope and dream for. Be honest and identify all opportunities to improve. Ask your customers for their opinions and what matters to them. Prioritize, then start chipping away to make the world better for your customers! Exceptional customer experiences are one of the few brand differentiators that are still hard to imitate. To encourage and cultivate raving customers, you want to provide outstanding experiences that set your company apart and leave an indelible impression. I’m not saying don’t meet expectations. But, that just the ante for playing in the game. I’m implying that “good enough” is not good enough anymore. In order to raise the bar and achieve the WOW factor, your experiences that you provide customers must go above and beyond their expectations. This may sound like a broken record, but this bears repeating! Your customers aren’t wowed by “good enough” experiences that just “meet” their expectations. Being “good enough” won’t give you a competitive edge. To have a growing, thriving business, you need to have customers come back time and time again. Loyal customers. They need to spread the good word about your company. 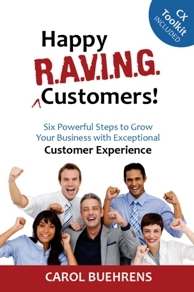 To foster customers like these, raving customers, you must do more than simply meet their expectations! You need to provide innovation experiences that exceed their expectations and delight their senses. Keep on top of your ever-changing customer’s expectations by talking to them, gaining their feedback, and creating a strong relationship. If the experiences you provide your customers aren’t continually innovative, you may find yourself playing catch-up while falling further behind your competition. 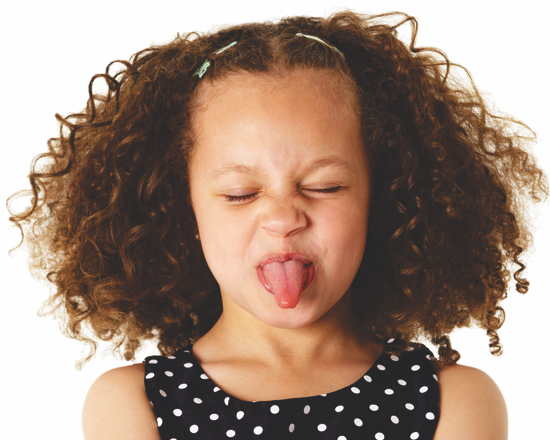 Are Your ‘WOW Factors’ Impressing Customers or Holding You Back? It’s amazing how fast everything moves in this day and age. 2015 will be no different. In fact, it promises to be the most exhilarated year for customer experience. The same holds true for our customers. Customers are, quite literally, raising their expectations and pushing the bar higher daily. What was once considered WOW last year may now be ordinary, mere table-stakes to stay in the game. In fact, your previously differentiated experiences might even be holding your company back today. A close friend of mine recalls this story about traveling for business and how the WOW factor can quickly change. A few years ago, she would go out of her way to stay at certain hotels that offered a “business office”. This was the WOW factor for her; a small room by the main hotel office that provided a few desktop computers and a low-end printer. These early offerings were available during certain “open hours”, you had to leave your room to access the computers, and typically the Internet availability was restricted. If you needed to complete an important presentation for a meeting the next day, you’d be force to trample downstairs in your bunny slippers and robe, hoping that the business office was opened, or at the very least, that a computer was available. 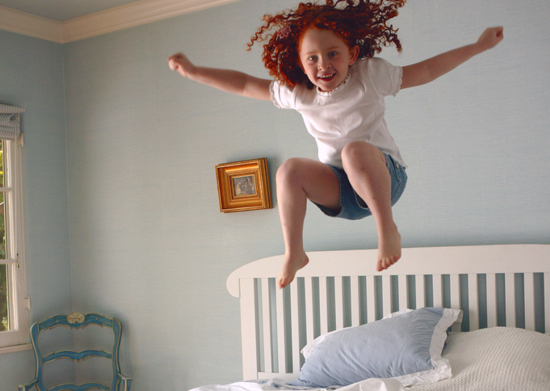 Skip forward a couple of years and this same WOW offering became a table-stake for hotels. If they didn’t offer it, they literally lost the business traveler trade. In other words, it was no longer a WOW, customers raised it to an expectation. Jump ahead another year and the WOW factor became in-room Internet connections, usually with a room fee. Of course, you had to be in your room to enjoy it. That’s certainly not a WOW anymore. In fact, most of us probably expect the hotel we’re staying in to have internet Wi-Fi technology, accessible throughout all areas of every room, including meeting hotel rooms, restaurants, and of course, poolside. Today, if your hotel only offers a business office and no Wi-Fi capability, you’re out of the business traveler game. What was once the WOW is now holding you back. Don’t settle in and think that your WOW experience is going to continue to satisfy customers for years to come or even in the short term. To truly differentiate, you must stay in front of your customer’s expectations! But I want to be clear; customer service excellence is foundational to great customer experience. You may have your customer experience strategy neatly in place and improvements to your customer’s journey may be afoot. But, unless you can deliver excellent service, consistently and across all channels, the biggest “proof-point” of your brand value will be a failure. 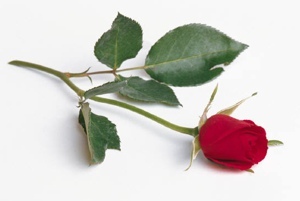 Exceptional customer service doesn’t happen by accident; this is carefully nurtured with passion. It demands a customer service strategy, alignment with business and customer experience strategy, and a well-designed plan and roadmap. Become a more “customer-centric” organization. Deliver emotionally engaging customer service. Develop and maintain a customer service model and definitions. 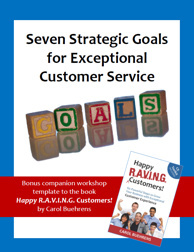 Download your free E-Book “Seven Strategic Goals for Exceptional Customer Service Workbook” to help jumpstart your Customer Experience Action Plans! In my new book, Happy R.A.V.I.N.G. Customers!, “Chapter 4. A = Align with Strategy” focuses on how you can create a customer experience strategy and a plan that contains the important ingredients for success. Your customer service strategy and goals work hand-in-hand with your customer experience strategy. Your Customer Experience Strategic plan should deliver results. But does it? Why make a Customer Experience Strategy Plan unless you can see it through. But, it’s no easy task to get everyone following your marching orders (and I know this from experience). To strengthen your plan and develop your roadmap, you’ll need to formulate appropriate, actionable goals. And, you’ll want to partner each goal with measurable objectives. While every business is different and goals will vary, here are Six Essential Goals that are pretty foundational to any CX Plan. Download the free E-Book, “Six Essential Goals for Customer Experience Strategy”. 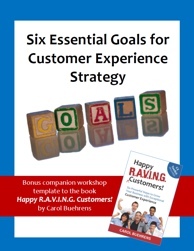 This E-Book also includes helpful objectives in easy-to-use Customer Experience Goals workshop templates. I hope this gives you a big head start in preparing your own Customer Experience Strategy Action Plan! Deliver emotionally engaging customer experiences. Download the free E-Book “Six Essential Goals for Customer Experience Strategy” to help jumpstart your Customer Experience Action Plan! In my new book, Happy R.A.V.I.N.G. Customers!, “Chapter 4. A = Align with Strategy” focuses on how you can create a customer experience strategy and a plan that contains the important ingredients for success.